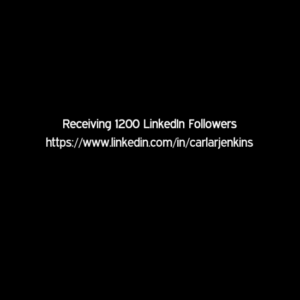 I am very happy to receive 1200 LinkedIn Followers (I am currently at 1237 and aim to get to 1250 by this week!). Uploading business-related LinkedIn native video content has led my growth. I have not posted a new LinkedIn Pulse article in 2 weeks; but, having 228 articles in my archives keep my readers entertained. This February 2018, I am creating a whole lot of new business related videos. I cannot wait to share them on LinkedIn so follow me here: www.linkedin.com/in/carlarjenkins.